A residential high-rise project in Dubai has been conferred with a Guinness World Record for the “longest continuous pouring of concrete” undertaken at its site earlier this month. 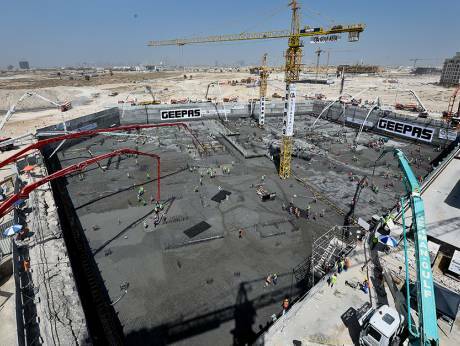 The process — involving 20,000 cubic metres of concrete — took up 42 hours at a stretch at the Geepas Tower site in the Arjan cluster at Al Barsha. The RP Group owned Gulf Asia Contracting oversaw the works that started on September 9. “Because the built-up area was spread over 145,000 square feet, it was felt that a raft foundation would work better than piling,” said Nizar T.N,, Executive Director at Western International Group and the developer. “The main reason was we could save on both time and costs using the raft method. In terms of time saved, a typical piling work would take anywhere up to six months for a standard high-rise on 30,000-40,000 square feet, whereas we finished the raft foundation in two months. “It’s a high-density structure that will be built on-site — limiting the foundation works to two months gives us ample time to take care of the rest of it. The Geepas Tower — scheduled for a March 2018 completion — will feature 684 apartments across the 19 levels. In addition, there will be 40,000 square feet dedicated to retail offerings. “Our intention is to lease out the units, create a recurring revenue stream for the Group,” said Nizar. “The project marks a gradual expansion of our residential real estate interests, which we launched by picking up tower projects from other developers in Ajman. The real estate portfolio is valued at Dh1.8 billion and the company has also acquired plots in Jebel Ali Hills, which will be used for mid-rise apartment buildings. “There are other possibilities we could consider with real estate development — but the preference is for leased assets rather than freehold,” said Nizar. The Group has a turnover of $2.1 billion (Dh7.7 billion) built around its supermarket chain (under the Nesto branding) and the “Geepas” range of electronics and home appliances. The former has the largest share — at 50 per cent — of the Group’s turnover. It operates more than 50 outlets in the Gulf.